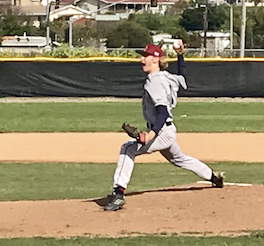 SANTEE (3-30-2019) – All of the attention was rightfully directed toward Valhalla High pitcher JoJo Ingrassia, and for good reason. Ingrassia was making his first start since tossing a no-hitter, and by some sort of convergence of stars, Friday’s (Mar. 29) opponent the same ballclub he no-hit last season as a sophomore. And, yes, Ingrassia was carrying yet another no-hit bid through four innings. However, West Hills starting pitcher Kai Dennis was also tossing a shutout, so when you learn that the Norsemen eventually claimed this Grossmont Valley league contest by the unlikely count of 16-0, one can wonder what happened. 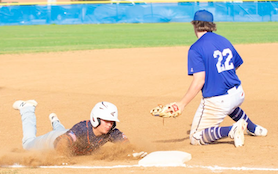 While Ingrassia finished with a 2-hit, complete-game shutout, the difference in the outcome could simply come down to the little details, including one made by Valhalla second baseman Aaron Lopez. Two batters earlier, Dennis struck out O’Sullivan on an 0-2 curveball which nipped the outside corner. So now here was Lopez, also facing an 0-2 deliver. Some might call it an accidental single, with the batter perhaps hoping for a foul ball, but Lopez’ “duck snort” fell fair inside the first-base line for a single to end the scoreless tie. But when the ball was later misplayed, all three runners scored for a 3-0 lead. And the flood gates not only opened it turned into what meteorologists call a 100-year flood. The Norsemen would score seven times in the 5th, then 11 additional markers in the 6th for what looks on the surface as an easy win. 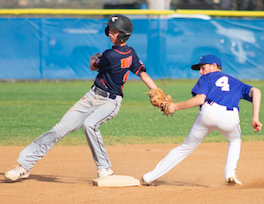 For four innings, little was certain for Valhalla, especially after dropping their GVL opener to Mount Miguel last week. Dennis finished with seven strikeouts, but defensive mistakes would land the lop-sided triumph to the Norsemen. Kyle Casper led the Valhalla attack with 3 RBI, batting 2-for-4 with a double. Ingrassia and O’Sullivan also collected two RBI each. In addition, Lopez went 2-for-3 with two walks, two RBI and scored a pair of runs. Meanwhile, the first long inning saw Ingrassia, who finished with 14 strikeouts, sit for maybe too long. In the home-half of the 5th, Dennis lined a one-out single to left field and both hitless streaks. The other Wolf Pack hit was a one-out single in the 6th by shortstop Joe Thrailkill. Valhalla (11-4 overall,3-1 GVL) remains a half-game between behind Steele Canyon while breaking its tie for second place with West Hills (3-11, 2-2 GVL). 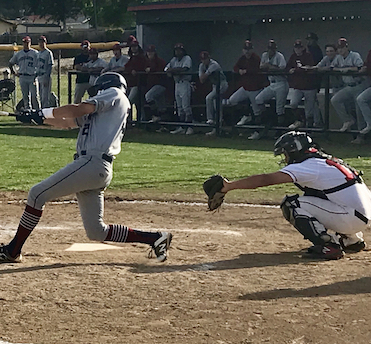 STEELE CANYON 13, MOUNT MIGUEL 2: At Spring Valley, the host Matadors were hanging with the Cougars for three innings Friday (Mar. 29), then the GVL leaders erupted for six runs in the 4th inning for the victory, maintaining a half-game lead on El Capitan and Valhalla through 2-of-7 weeks of league play. “For us to compete with teams like Steele and Valhalla, we really need all phases to go well,” Mount Miguel head coach Frank Coit said. “Today, few did. We got to 3-1 and just kind of saw things unravel from there. Cleanup hitter Carlos Camacho drove in four runs, while first baseman Billy Tellous smacked a leadoff homer in the 6th to pace the Cougars, a ball that was estimated at between 415-430 feet. “I thought we had a good game,” Tellous said. “The first two at-bats with (Mount Miguel starter Nico) Camacho, he throwing me low and away. Camacho, the left fielder, knocked in runs with a single in the 1st, a ground ball in the 3rd, then a 2-run single in the 4th. In addition, third baseman Eli Page posted his second straight 2-hit outing. Mount Miguel was limited to three hits and an unearned run in five innings against Cougars winning pitcher Brad Barkley, who struck out three batters. “Lately, I’ve just been able to see the ball a lot better,” Page said. “I’ve been putting in constant work since the beginning of last summer in preparation for this season, and I definitely see that effort coming into fruition. Matadors right fielder Ricardo Partida posted two hits, Meanwhile, J.D. Laverdiere posted an RBi base hit in the 2nd, then Thomas Ringer doubled in the 7th. Brad Barkley, of Steele Canyon, allowed three hits over five innings for the win. “My fastball was my go-to pitch,” Barkley said. ” threw my cutter and it had great movement to get a backward K, so I was just happy I threw that pitch. “I love to see all the guys swinging the stick. Billy Tellous had a monster home run. I feel like we have something to prove since last year didn’t go as planned. I’ve definitely got a chip on my should going into this year. Nico Camacho was tagged with the loss for the Matadors. “I felt like my mechanics weren’t bad because I could throw my fastball and if I missed it wasn’t by much but, my inability to throw my off-speed for a strike is what made the game what it was,” Nico Camacho said. “Everyone knows I’m a strikeout pitcher, that depends heavily on my off-speed because I throw a low to maybe mid-80s on a good day but my off-speed is my key to either set up the strikeout or complete it but today I couldn’t throw to save my life. “I should’ve pitched more to let them hit but to a team that hits fastballs and we saw that last game, I couldn’t throw a fastball and just let them hit it because I know what they can do but it was just a bad day on the mound for me. I know that’s not who I am and I’m sure my team knows that, too. I know I’ll bounce back and be better than I was last time. EL CAPITAN 14, EL CAJON VALLEY 1: At ECVHS, the visiting Vaqueros posted nine runs in the 2nd inning to mount a quick 11-0 lead in this 5-inning contest, remaining one of two unbeaten ballclubs in Grossmont Valley League play. They stand a half-game behind Steele Canyon. Jake Bergherm knocked in two runs for El Cap, while the bottom third of the Vaqueros batting order received 2 RBi from both Nick Molitor and Rene Ponce. Meanwhile, shortstop Austin Bell had his first 2-hit game of the season even though he owns hits in 9 of 10 contests. His hitting streak reached seven. The Braves’ first batter, Robert Verdugo, quickly scored in the 1st. The center fielder opened with a lead single, then stole second base, A ground ball by Greg Sanchez sent Verdugo to third, then he scored on a passed ball. The single was the lone hit allowed by a trio of El Cap pitchers, as Larry Snow pitched the first three frames to garner the win. 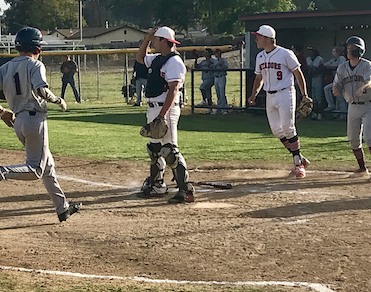 OLYMPIAN 10, MONTE VISTA 0: At Chula Vista, Eagles pitcher Anthony Inzunza tossed five innings of 4-hit shutout ball, then a pair of relievers yielded just one additional hut, racing past the visiting Monarchs in Friday’s (Mar. 29) non-league contest. Olympian received three hits each from Andres Contreas (3 runs), Aaron Garica (2 RBI), and Alex Angulo (3 RBI), deciding this game early after scoring five times in the 1st inning, then three more in the 2nd. Among the hits by Contreas was a triple and a double, falling just a home run shy of the cycle. The Monarchs saw Andy Canedo collected two hits, while the bottom third of the lineup produced base hits from Chris Leask and Cam Schuler. With the victory, Olympian (9-3) sweeps the 2-game season series from Monte Vista (7-7).